Introductory Science Program (Grade 1): This program provides students the opportunities to develop their understanding of the basic science behind our daily life through different activities. It also aims to stimulate their interests and curiosities about the environment and the world around them. In addition to science discovery, vocabulary and language skills as well as mathematical knowledge are the main aspects of this program. This program includes 4 courses and each course consists of 9 lessons. There are a total of 36 lessons in this program. Primary Science Program (Grade 2-3): This program focuses on the development of the understanding of scientific terms and concepts. Students discover firsthand what science is really about by exploring and investigating the fundamental knowledge of science. This program ultimately provides the opportunities for students to become aware of the main scientific theories and to explore basic laboratory apparatus and tools. This program includes 8 courses and each course consists of 9 lessons. There are a total of 72 lessons in this program. Intermediate Science Program (Grade 4-5): This program focuses on the development of the understanding of scientific theories by experimenting on the scientific concepts. The formal steps in conducting experiments (Aim, Materials, Procedure, Data, Results, Data Analysis, Discussion and Conclusion) as well as standard laboratory protocols and proper use of basic laboratory apparatus are introduced in this program. More in depth scientific knowledge is taught and students are introduced to the relationship between different areas of science. High School Science Preparation Program (Grade 6-7): This program focuses on the development of the understanding of scientific theories especially in the subjects of Chemistry and Physics. The formal steps in conducting experiments (Aim, Materials, Procedure, Data, Results, Data Analysis, Discussion and Conclusion) as well as standard laboratory protocols and proper use of basic laboratory apparatus are the main aspects of this program. Report writing and the application of Mathematics in science are also taught in this program. This program ultimately provides students the opportunities to explore some of the most important theories in science and to prepare themselves for studying science at high school. Holiday programs are offered during summer holidays and school term breaks (117 lessons). In additional to the scientific aspects, these programs also incorporate the application of Mathematics (measurement, graphing, percentages, averages, order of operations and logic) and English language (scientific and non-scientific vocabulary, reading and writing skills). We are looking for ambitious and enthusiastic individuals or companies with a passionate commitment to develop an international brand in the long term. You will be a dedicated leader with entrepreneurial spirit who will work tirelessly to build a strong and successful World of Science business in Thailand and provide high quality education to children. As the Master Franchise owner, you can generate revenue by opening and operating your own World of Science centers and selling local franchises in Thailand. Your franchisees would pay you an initial fee for each World of Science centre you consent them to start up and operate. You would be responsible for providing support service and training to the World of Science local franchisees. Each month they would also pay you a royalty – a percentage of their revenue or a fixed fee. A person with strong desire to develop a national brand and has a passionate commitment to enhance children’s education. A highly organised, ambitious and enthusiastic business person with strong leadership abilities. Interested in science and experiments. Understanding the nature and values of educational business. Very keen and have a long vision in running educational business. A highly motivated entrepreneur who is committed to operate the successful business in the long term. In financial strength with adequate funds to develop World of Science networks in Thailand. Exclusive territorial rights in Thailand. The right to own a Master Franchise permanently within Thailand. The right to use the trade name and branding. The right to use the Science Learning Programs intellectual property including the Lesson Plans for all 369 lessons. Each lesson plan is presented as three Microsoft Word documents which include a teacher’s version, a presentation version and a student’s version. 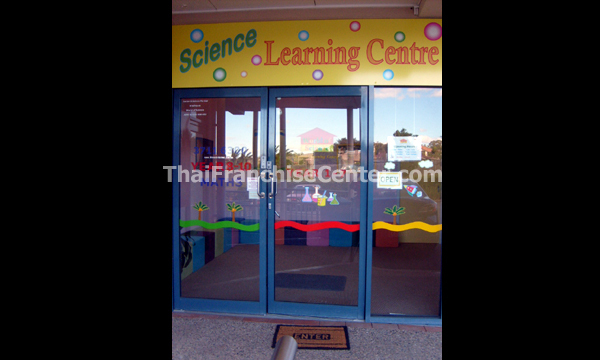 The right to open and operate your own World of Science centres within Thailand. The right to sell domestic franchises in Thailand at your desired cost as well as terms and conditions and also the right to charge for ongoing royalty fees. The start up and Business operation manual. Comprehensive Training Program and ongoing support. Unique Academic Science Programs that include 369 lessons. Full lesson plan for Grade 1 to Grade 7 (age 6 -13). More than 1,100 academic experiments which are all successfully proven and tested (data and results are included). All lessons include discussion questions and homework questions. All answers are provided. Minimal competitors when comparing to Mathematics and English. Can be offered in both English (for EP students and students from international schools) and Thai (where translation is needed).